The fountain is made of ABS plastic which is safe for your cats and the charcoal filter promises to keep the water clean and healthy. It is extremely quiet and the automatic circulating water and 1.6 capacity helps to ensure that your pet drinks regularly. There are numerous water fountains on the UK market, each providing a continuous stream of fresh water. 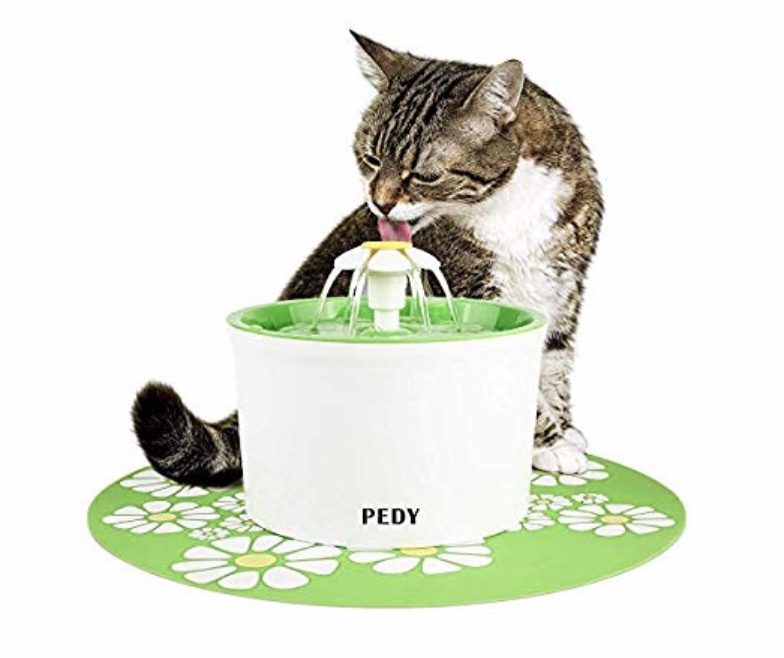 Since all three of my cats are used to drinking water on a high surface (away from our dog), I wanted something that was not bulky and would fit onto our kitchen ledge. It has has a steady trickle of water which our cats love, it is easy to assemble and takes up little room. It also ensures that the water is clean and there is a maximum line which helps to prevent overfill. The silicone mat is easily foldable for smaller spaces and brilliant for spillages and its little yellow petal makes it quirky looking and attractive to look at. Pedy is easy to take apart and clean and you can buy the filters separately, which are available online. It has three different settings which are ideal for picky drinkers and offers maximum oxygenation for fresher, better tasting water. This fountain retails at £18.99 on Amazon with free UK delivery, which compared to other similar fountains of the same specification, is extremely reasonable. I would definitely recommend this product which can be purchased from any reputable pet store, or online.